If your looking for transport in Taiwan that's affordable, convenient and lets you be the master of your own itinerary; then we may have just what you are after, its called Ding Taxi. Arriving at an airport and jumping into a taxi is arguably the preferred option for most but taxis are expensive and for long distances, they add up quickly. This is precisely why Ding Taxis has become so popular in Taiwan, they have affordable rates that are predetermined prior to jumping into the cab. What's more, the company also offers private tour services with English speaking drivers, and you can plan a whole day (or a couple of days) travel including getting lots of great itinerary advice beforehand. It's a super cool and convenient way to plan your travels while you are in Taiwan and it's really easy to do. According to Ding Taxis website, the best way to travel is to ‘Travel Like a Local’, and with none of the stress and hassle of planning on your own you'll be able to do just this through a few simple clicks, whilst being in control of it all. It really is that awesome! At affordable prices and with an easy to use APP to keep in contact with your driver, Ding Taxi offers great Taxi services all over Taiwan. What makes them unique, is that you are able to choose only where you want to go, and it can all be planned before you arrive in Taiwan. Ding Taxi claim that they are the top recommended travel service in Taiwan, which is rather impressive and you will find their website is full of options to explore with pre-planned options too if you would like some help. You can also chat with someone online if you have any questions or need advice on where to go or to find some help to smooth out your travel plans. You can also review passenger reviews online. Choose your preferred vehicle ( depending on preference or group size). Compare prices & reviews instantly. Pay deposit. Secure your reservation by paying a deposit online. The remainder can be paid in cash when you use the service. Submit trip details. After you deposit payment, you can then input your itinerary details for the driver. Download the APP, discuss your trip and contact your driver with the exclusive DingTaxi APP. Hire a local driver-guide to show you around Taiwan. DingTaxi provides 24-hour airport shuttle services and you can choose your vehicle preference. Submit your customized trip plan and DingTaxi will provide the right quotations to meet your needs in Taiwan. They also offer bus rentals. Download the DING tax APP. AirPoPo Taiwan: Convenient Airport Transport. AirPoPo is an affordable and convenient way to catch a ride to or from the Taoyuan International Airport (TPE) in Taiwan. AirPoPO, who won the Jury prize at the IDEAS Show@APEC IN 2016, offers services from Changhua, Taichung or Taipei or any nearby area, and won't leave you feeling out of pocket. You can get a low-cost shared-ride shuttle or a private-ride charter service, simply by using their app to reserve the 24-hour service. If you want to enjoy a comfortable trip and save money, you will find AirPoPo to Taoyuan Airport convenient, cheap and frankly fantastic! Make a reservation, inputting you address and time of collection. If you have any queries on how long it might take to get through customs if you are arriving in Taiwan for the first time, simply email Airpopo for advice ( support@airpopo.com | (+886) 905-265-067). They are very friendly and prompt to respond. If you are using the shuttle service you should book at least a day ahead as there are limited seats, however, by using the APP for a private ride, you can book just 15 minutes before. AirPoPo drivers will contact clients by phone on arrival, but you can contact AirPoPo via email, messenger or WhatsApp too. For pick up at Terminal 1, go to Arrival exit no.18 Pillar. For Terminal 2, exit no. 27 Pillar. The boarding info, however, will be sent to you 1-2 days prior to the appointed date. Airpop accepts VISA, Mastercard, and JCB, but do not accept cash. Payment must be made before you ride through the APP, via phone or online. For shuttle ride, an additional late-night charge of 100NTD per person is applicable between 23:00 – 07:00. For Private ride 300NTD per car is charged for late-night charge. Other ways to book a ride. You can also Reserve Via Phone or through LINE, Whatsapp or your Wechat ID. Alternatively, go to the Ding Taxi website where you will also see a comparison of prices between Airpopo and other airport transport services on offer. If you book through Ding Taxi, however, you must download their APP even if you book an AirPoPo ride. Air PoPo shuttle service is very convenient as it doesn't have a fixed schedule or specific routes it needs to follow. Therefore depending on the traffic flow or on the number of people it needs to collect, you will be taken the shortest route to the airport. Unlike other airport shuttles that have to follow a specific route, AiPoPo is flexible. From around 6 US Dollars (Taoyuan Airport to Taipei), AirPoPo costs 1/3 the price of a Taoyuan Airport taxi and its travel time is much faster than using the MRT (subway). For passengers in a group or with lots of luggage, AirPoPo also provides cheap private Airport transport to Taipei, Taichung, and Changhua or vice versa. Phone +886 905-265-067 to inquire about fares, or go to the Ding Taxi website. For all you ceramic enthusiasts out there, Yingge is the place to be! It is a town not too far out of Taipei and is very well known for its famed pottery: the high-quality clay deposits found in the region have made Yingge a center of ceramics production, since the 19th century. The word means “parrot song” in Chinese, supposedly getting it from the parrot-shaped rock in the north of the town. There are plenty of activities to do in Yingge for the day, there is a Ceramics Museum, an old street filled with countless ceramic pottery and craft shops, and even some DIY pot-making workshops! Seeing how popular the ceramic culture in Yingge has become, the government established this museum to show people the history of the ceramics industry in Taiwan. It is very well organized and beautifully displayed, with audio guides available in both Chinese and English. Ready for some crazy pottery shopping? The old street offers ceramics of all kinds, from basic teapots and dinner plates to finer luxury flower vases; prices vary depending on the quality. Warning: the street might be full of tourists and shoppers on weekends, so try to come here during weekdays. If you still haven’t had enough of pottery, go on and make one yourself! A lot of the shops provide DIY classes on the side (although for the more popular ones you might need a reservation in advance), the Ceramics Museum itself as well. You get to learn the whole process of pottery making while designing and making your own one. You won’t be able to get the finished product right away, as it takes a few days to dry and fire, but most shops provide delivery service afterward. There are TRA trains that go directly from Taipei Main Train Station to Yingge Train Station, it only takes about 30 minutes. If you want to have a slower paced day, plan a trip to the tea hills of Maokong, which includes a fun gondola ride up to the top of the mountain, an interesting visit at Zhinan Temple, and an enjoyable meal at a teahouse over the scenic night view of Taipei. The best times to take the gondola up are when the sun is setting, and when the lights of the city are shining at night. A ride up to Maokong takes about 20-30 minutes, so you will have plenty of time to admire the views below you, such as Jingmei River, the thousands of cars moving along the freeway, and the never-ending tea hills. Tip: since prices are the same, pick the crystal cabin so that you get a see-through glass floor for a more thrilling ride! If you are into temples, get off at Zhinan Temple station for a quick visit. It is known for its long history and importance to the Taoists of Taiwan, mainly worshipping the deity Lu DongBing (who is one of the eight Immortals of the Taoist pantheon). Once you arrive at Maokong, you will see plenty of tea plantations and a variety of teahouses, each one of them providing a range of high-quality tea selection. It is very popular among locals to drive up here for tea and late-night chats with friends, over a beautiful night view of Taipei. Remember to try the famous “Muzha Tieguanyin” and “Wenshan Pouchong tea”! Take the MRT to Taipei Zoo station (at the end of the brown line), and walk to the gondola station nearby. From there, the gondola takes you past the Zhinan Temple and up into the tea hills of Maokong. A one-way ticket to Maokong costs 120NT ($US4.00). Fly a sky lantern on the railway tracks! Once a year they hold a huge festival in Pingxi, where hundreds of lanterns fill up the whole sky like little fireflies, but don’t worry, you can do it anytime you want. You get to write your wishes on the lantern and fly it up yourself. To all the cat lovers out there, this is a place you do not want to miss. Houtong is an old mining village literally full of cats (they’re nice and tamed), with a beautiful scenery of mountains and rivers. Old Japanese tea houses line the hill side in Jiufen, TaiwanProbably the biggest tourist attraction outside of Taipei, Jiufen is a small town up in the mountains, known for its breathtaking ocean and sunset views, its old streets, and perhaps most importantly its movie fame: it is said that Jiufen inspired Japanese producer Hayao Miyazaki for his famous movie Spirited Away. Buy a Pingxi day-pass at Taipei Main Train Station, it costs 80NT ($US2.70) and you get unlimited rides along the line. Take the train to Ruifang station, and from there get on the Pingxi line. Start from the end of the line at Pingxi, and slowly make your way back, through Houtong and finally Ruifang, where you need to take a taxi or bus no.788/1062 to reach Jiufen (it won’t take more than 15minutes). What’s not to love about traveling by train, it's relaxing, and much faster than a car but without any of the stress associated with traffic and unfamiliar roads. Taiwan's trains are efficient, and fast, showcase beautiful landscapes right around the island with comfort and connect all major cities. It is a system easily accessible to the traveler and what’s more, English signage is pretty decent and available in most stations and on trains. Taiwan's railway will take you from one end of the island to another in just a few hours by high-speed train and although there are no trains that run centrally into the mountainous regions, there are tourism branch lines that do. Tze-Chiang (limited express), Chu-Kuang (express) and Fu-Hsing (semi-express). These are express trains and are therefore the fastest, and most expensive. However, discounts are available for senior citizens, children, and there are ‘early bird sales’ when purchased in advance, so try to make use of this. The high-speed trains run from Nangang, just north of Taipei City, and go all the way down south to Kaohsiung. Tze-Chiang is the fastest, most comfortable and expensive train in Taiwan. The trains only stop at major stations. It is advisable to reserve a seat so you don't have to stand, especially on the weekends or on a national holiday. Chu-Kuang and Fu-Hsing are slower than Tze-Chiang but still fast and stop at more stations between the main cities. They can get crowded often and are definitely not worth riding without a reserved seat. Fu-Hsing applies to shuttle trains. Chu-Kuang applies to Puyuma and Taroko. These access a majority of locations all over Taiwan, stop at every station and are cheaper. They are slower too with speeds that vary as they can be very old or very new. You cannot reserve seating but are generally quieter than the express trains. If you are happy to take your time they are air-conditioned and do make for a peaceful and enjoyable trip. It is advisable to book in advance and reserve a seat, especially if you plan to travel on weekends or on a public holiday. If you book in advance you may also be able to get an ‘early bird’ discounted rate. Tickets can be booked 14 days in advance online or 12 days in advance in person at a train station. Online. You can book on the Taiwan Railway Administration (TRA) website, your passport number is required but it is very easy to do. You then need to take your booking number to any train station or convenience store to pay within two days of making the booking. Convenience store. You can use an Ibon kiosk at a 7-Eleven to book your train ticket. These are, however, only in Chinese, but you might find a friendly store assistant who can help you. It will print a slip, which you need to take to the counter, and pay. This will validate your reservation. Train station. Go to any train station with your passport and book your ticket at the kiosk. Tickets: What Are The Options? Single journey tickets. If you have a set schedule. Return tickets. Return to the departure station. Taiwan Railways, Multi-card system, Easycard, IPass and Taiwan smart card. These can be used if you want to go cash free and a 10% discount is given on some of the lines. Go to http://www.easycard.com.tw/english/use/index.aspx for information on the Easycards. TR Pass.For students. Can be purchased at the station's ticket kiosk with a valid student ID. TR passes can take you on Intercity and Juguand trains unlimitedly during the valid dates. Day passes. The tourism branch lines (Pingxi, Neiwon, and Jiji). The pass may only be used on the day of validation. It may not be used without a validation stamp. You can hop on and off the trains as many times as you like within the designated zones. Find the appropriate schedule, and find the train you want. Visit the online booking system, or visit any convenience store kiosk, or head directly to a train station for their automated machine or windows to buy the ticket. If you decide to book online, write down the ticket code after booking, then pay online with a card within the specific time frame, visit a train station window (card or cash), or a convenience store to pay and pick up your tickets. Arrive 30 minutes early or earlier if you are collecting a ticket or purchasing at the station, there might be a queue. Go through the ticket punching gate, find your platform and car and wait there. The conductor will visually check the boarding process, so don’t worry the train won’t leave you if you’re being polite at the end of the line. After you board and found your seat if someone’s sitting on it don’t sweat just politely ask them to move or simply show them your ticket. If you do not have a reservation you are permitted to sit in an empty seat. Where to go souvenirs hunting in Taipei? When traveling, shopping for souvenirs on the last day of your trip is always one of those love/hate activities. It’s so much fun, but it also gives you a huge headache. What should I buy? Where can I get them? Is it the cheapest there is? Is the quality okay? If you’re having a hard time deciding where to start your souvenirs hunting, head over to one of the places below: they will give you plenty of ideas to choose from. The Red House located in Ximending is home to Taipei’s creative and culture industry. The complex of nearly a century old was originally built to serve as a public market place, and has evolved throughout time to become the multi-functional building of today, hosting art exhibitions and shows on a daily basis. Within the Red House, you’ll find a creative boutique of two floors filled with small shops promoting their own unique products. Postcards in the shape of a big tea bag (with actual tea leaves), “I LOVE TAIWAN” T-shirts written in Chinese calligraphy, old-school pins with Taiwanese sayings, aboriginal handmade scarfs… you can definitely find something special and different here. Note: if it’s still not enough, walk around in the Ximenting area for even more shopping, the prices get cheaper there! Due to its close location to the Dadaocheng Wharf, the 800-meters long street used to be the central trading market for Chinese herbal medicine, rice and tea, as well as fabrics. The whole area has a nostalgic feel to it, walking around makes you feel like you’ve jumped back in time. While being quiet on most days, Dihua Street becomes crazily packed a few days before Chinese New Year’s Eve, with thousands of people trying to squeeze into the shops for free samples and vendors yelling their lungs out. If you are into dried goods and candies, this is the place to be. There are a wide variety of stalls selling dried items and local snacks (there’s a “fish candy” that you must try, it used to be considered a yummy treat for kids back in the day), feel free to try them out before buying! You will have a lot of fun shopping here, at the biggest underground shopping street in Taiwan. It is more than 800 meters long, and has everything you can ever think of: food and drinks, makeup stores, massage center, electronics, clothing and even anime merchandise! There are also a lot of affordable and whacky souvenirs to buy; everything is cheap here so take your time to get lost. Taipei’s reliable, squeaky clean, and extremely efficient Mass Rapid Transit System (MRT), is one of the many reasons Taiwan is rated so highly as a tourist destination. In short the Taipei MRT is one of the best there is and brilliant. It is modern and exceptionally safe, easy to navigate, has free wifi, and with added extras like the ‘ anti peeping’ measures in the ladies toilets, it is no surprise that Taipei's MRT system is rated as one of the best in the world. At the moment Taiwan has three MRT systems operating. Kaohsiung MRT in the south (see our article on the KAOHSIUNG MRT). 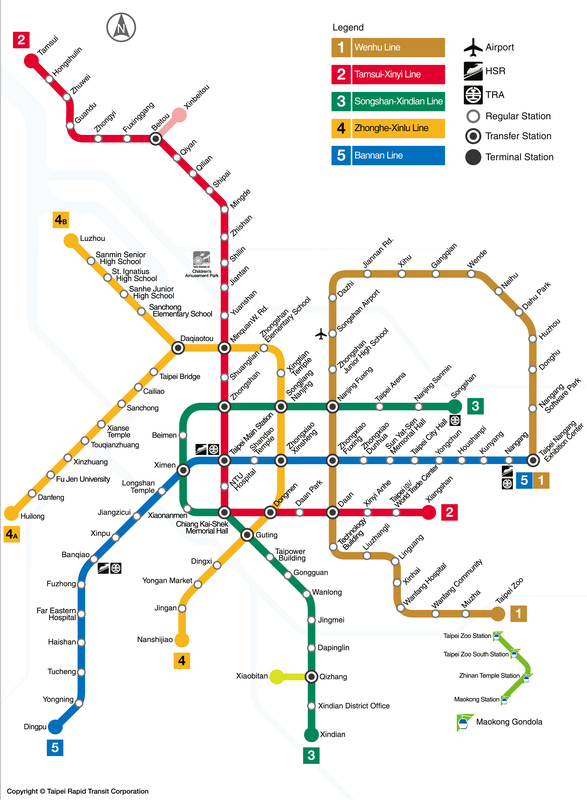 The city's metro system has six lines running outward from the center of Taipei, and transfers between lines are mostly close to each other. Each line has both a name and a color making it pretty easy to work out . Stations serve most areas of Taipei from 6 am to midnight and trains run smoothly and on time. Taipei Zoo to Taipei Nangang Exhibition Center. Tamsui to Xiangshan, Beitou to Daan and Beitou to Xinbeitou. If your final destination is Tamsui, be sure you get on a train that's headed to Tamsui, as some of the trains stop at Beitou. There is a signboard on the platform in English where you will see the destination of the approaching train, so it is not too complicated. This line travels Songshan to Xindian, Songshan to Taipower Building, Qizhang to Xiaobitan. You will pass Chiang Kai-Shek Memorial Hall, Songshan night market, Raohe night market, Shi-Da night market, Ximending shopping district, Gongguan and its underground music scene also Bitan riverside park. Huilong to Nanshijiao and Luzhou to Nanshijiao. Taipei Nangang Exhibition center to Dingpu , Taipei Nangang Exhibition center to Far Eastern Hospital. This line is often very busy as its the main line used in the city. There are ticket machines at each station that only accept cash coins, however if you need change, you can ask at the information desk. You can also purchase a ticket by the counter. Passengers carrying a bicycle should purchase an NT$80 ticket. Bicycle access is available on weekends and national holidays, 6 AM to closing. Access is not available on all lines so check before. This link is useful. Taipei Metro claims a customer satisfaction level of 94 percent and you will find that all personnel are extremely helpful and friendly. There are toilets at every station that work and are clean, with additional facilities such as breast-feeding rooms and, "Anti-peeping" in ladies' toilets. There are also special waiting room for women commuters, and intercoms in the trains and on platforms in case of trouble. There are free charging stations for your cell phones and computers in the stations . Signage in English, is also big and clear. If you are looking for the fastest way to travel in Taiwan, Taiwan's High-Speed Rail system is by far the way to go. In fact, the system is not just for those who are seeking speedy travel, you will find the High-Speed Trains comfortable and really convenient to your travel itinerary and with an option to purchase a ‘special’ tourist pass, hopping on and off at Taiwan's cities and towns has never been so easy or so fast. Reaching speeds of 300 km/h (186 mph), Taiwan's High-Speed Rail system really is a breeze for the traveler. Taiwan's High Speed Rail (HSR) operates between 06:30 to 24:00 every day and connects Taipei (Main Station) in the north to Kaohsiung (Zuoying station) in the south , stopping at Banqiao, Taoyuan, Hsinchu, Miaoli, Taichung, Changhua, Yunlin, Chiayi, and Tainan along the way. Tickets: How to book them. There are a number of different ways to purchase an HSR ticket, and you can book in advance or on the day of travel. If you purchase at the station, do make use of the ticket vending machines, as ticket booths can have long queues. These are easy enough to use and have an English menu. The default, however, is in Chinese, but if you swipe the bottom of the machine you can find an English option. You can also buy a ticket at any convenience store in Taiwan or book online and print it out there. Store attendants are very friendly and will help you work the IBON machine if you have trouble. Basic English is generally spoken. Essentially there are three classes of ticket: business class, standard reserved and nonreserved tickets, however, there are additional ticket ‘packages’ that can be purchased for tourists. Nonreserved seat, you can choose any available seat in the nonreserved cars number 10 - number 12, there is a 3% discount. Reserved-seat, standard/business class. You can reserve a seat 28 days before departure and up until 1 hour before. Payment needs to be made within three days after booking. You can book and pay online at the Taiwan High-Speed Rail booking site here https://irs.thsrc.com.tw/IMINT?locale=en or you can call the THSR's customer service hot-line at (Taiwan) 4066-3000. You can also buy and print tickets at a convenience store or the HSR station. Take your passport and the reservation number (if you are printing a ticket booked online). If you are a visa-free tourist, you must book this outside of Taiwan as you need to present your visa if you purchase in Taiwan. THSR 2 Day Pass: Unlimited HSR use for a two day period in a specified week, you choose the days. NT 2500. THSR 3 Day Pass: Unlimited entrances and exits for a three day period after the activation of the ticket.NT 2200. Group discounts: offered for groups of 11 or more. A group discount does not include non-reserved seats. Senior citizens: If you are over the age of 65 may purchase tickets for senior persons with a valid passport ( tourist) or ID cards for residents. Children (6-12): Children less than 12 years of age, may purchase a child's ticket on proof of ID or Passport (tourist). Children and Infants( 0-6): Children less than six years old with proof of ID or passport may be exempted from Tickets. Disability: Physically and mentally disabled people may purchase disabled tickets, provided that they present their disability manuals or similar. Car number 6 is business class. Car number 7 is fitted with 4 wheelchair accessible chairs and a disabled-friendly restroom. The metro system in Kaohsiung, one of a kind. Known as Taiwan's maritime capital, Kaohsiung offers scenic mountains, ocean views, awesome night markets, as well as Taiwan's biggest mall, with a Ferris wheel on top. Tourists will find Kaohsiung a sophisticated and modern city and its MRT or KRTC system (as it is known) is no different. In fact two of its stations, the Formosa Boulevard Station and Central Park Station, were ranked among the top most beautiful subway stations in the world. So if you will be traveling along the KRTC in search of an adventure in Kaohsiung, or if you are only seeking a ride to see its beautiful stations, you will find Kaohsiung's Metro system, clean, efficient and easy to use. The KRTC has two lines , the red and the orange, with operating hours from 6am to 11pm daily. The KRTC Line has 24 stations from Siaogang Station to Gangshan South Station. You will find Formosa Boulevard Station at the center of the line where the red and orange lines meet. Popular attractions along the way include the Dream Mall, Liouhe Night Market, Nanhua Tourist Night Market, The Heart of Love River, The Tower of Light, Hakka Cultural Museum, The National Science and Technology Museum and the Fengping Temple. The KRTC Orange Line has 14 stations from Sizihwan Station to Daliao Station. The line meets the red line at the Formosa Boulevard Station and well-known attractions are : Sizihwan Bay, Shoushan Scenic Area, National Sun Yat-sen University, Former British Consulate at Takao, The Pier-2 Art Center and the Liouhe Night Market. You can purchase your ticket at any automatic ticket machine at the station. There is an English menu if you swipe the bottom of the machine, and it is easy to use. They do, however, only accept coins but you can get change at the information booths. You can also buy tickets at the station ticket counters. Depending on your journey tokens cost between $NT20 to $NT65. If you are only going to be using the KRTC for a brief trip, this is the way to go. Can be purchased at the station's ticket counter at NT$120 and can be used as many time as you like for a day. Can be purchased at the station's ticket counter at NT$250 and can be used as many time as you like for 2 days. If you are staying a while and plan on traveling the system a lot this is the way to go. They are easy to carry and safe to use and every card costs NT$100 before you top up. Fares calculated based on length of the journey, some journeys have a 15% discount. http://www.easycard.com.tw/english/index.asp and https://www.i-pass.com.tw/en. LRT (Light Rail Train) SYSTEM. Kaohsiung Light Rail System is the first of its kind in Taiwan. The Light Rail, also known as the Circular Line, interchanges with both the Orange and Red MRT lines, meeting at Formosa Boulevard in the city center. It includes many Kaohsiung attractions like the Kaisyuan Night Market, Jingzuan Night Market, and the Dream Mall and its focus is on promoting tourism in the region. The fare for a one-way trip is NT$ 30 and you can purchase tickets at the Automatic Ticket Issuing Machine at KLRT station or at a ticketing booth.